A step by step approach to story development, from concept to completed story for your novel or screenplay. More than 200 interactive Story Cards guide you through the entire process. The most powerful story structuring software available, Dramatica is driven by a patented "Story Engine" that cross-references your dramatic choices to ensure a perfect structure. The most advanced screenwriting software available, Movie Magic is deemed a "preferred file format" by the Writer's Guild. An industry standard, MMS is used by professionals and studios around the world. Interactive index cards - Name them, add notes, titles, colors, click and drag to re-arrange, adjust font, save, export and print. An essential tool for every writer. Are you a student, teacher, or academic staffer? Get the very best price on select products with these manufacturer sponsored academic discounts! *Try either or both for 90 days. Not working for you? Return for a full refund of your purchase price! Dramatica is a tool to help you build a perfect story structure. StoryWeaver is a tool to help you build your story's world. Dramatica focuses on the underlying logic of your story, making sure there are no holes or inconsistencies. StoryWeaver focuses on the creative process, boosting your inspiration and guiding it to add depth, detail and passion to your story. Dramatica has the world's only patented interactive Story Engine™ which cross-references your answers to questions about your dramatic intent, then finds any weaknesses in your structure and even suggests the best ways to strengthen them. StoryWeaver uses a revolutionary new creative format as you follow more than 200 Story Cards™ step by step through the story development process. You'll design the people who'll inhabit your story's world, what happens to them, and what it all means. By itself Dramatica appeals to structural writers who like to work out all the details of their stories logically before they write a word. 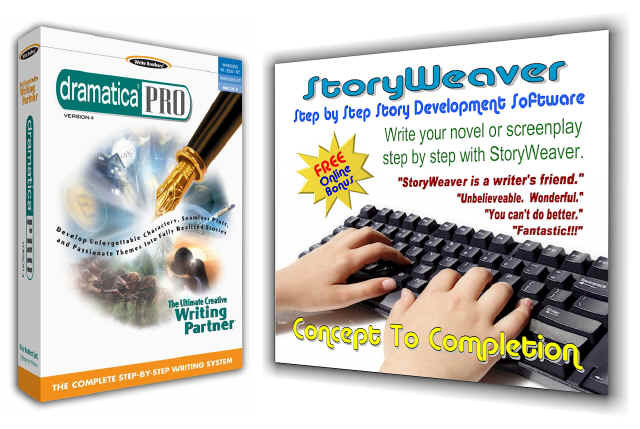 By itself, StoryWeaver appeals to intuitive writers who like to follow their Muse and develop their stories as they go. But, the finished work of a structural writer can often lack passion, which is where StoryWeaver can help. And the finished work of an intuitive writer can often lack direction, which is where Dramatica can help. So, while each kind of writer will find one program or the other the most initially appealing, both kinds of writers can benefit from both programs. Try Either Program Risk Free! We have a 90 Day Return Policy here at Storymind. Try either or both of these products and if you aren't completely satisfied we'll cheerfully refund your purchase price.